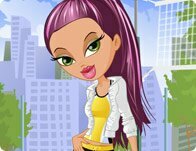 Description: This stylish blogger loves to comment on new trends, fashion do's and fashion don'ts! . Help her talk the talk and walk the walk with a cute make over!